Godzilla is a cult figure that continues to fascinate fans of all ages. Whether you are an avid collector or just starting to discover the action figures, there are many versions readily available on the market to add to your collection. Godzilla figures come in a variety of styles and sizes. Expect to find a wide range of action figures from collectibles from the 1960's to ones that are more modern and realistic and suitable for play. You can find Godzilla toys online at a variety of sites catering to kids and collectors alike. Godzilla 2001: This collectable figure is still in the box and is priced under $300. it is crafted from vinyl and stands 30 centimeters high. 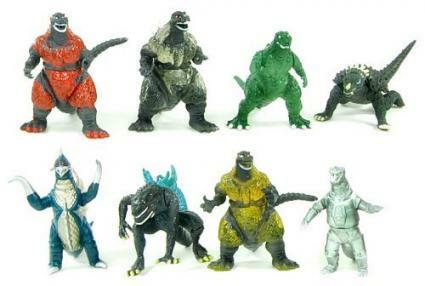 Godzilla 6 Inch Collectible Figures: This set is sold in a case of 12 and is priced under $145. It includes two of each: Millennium Godzilla, Fusion Series (clear) Millennium Godzilla, Rainbow Mothra, Fusion Series (clear) Rainbow Mothra, Burning Godzilla and Fusion Series (clear) Burning Godzilla. S.H. MonsterArts Godzilla Junior: This figure displays exceptional attention to detail. It portrays Godzilla Jr. as seen in the Godzilla vs Destoroyah film and also includes two helicopter accessories and a display stand. 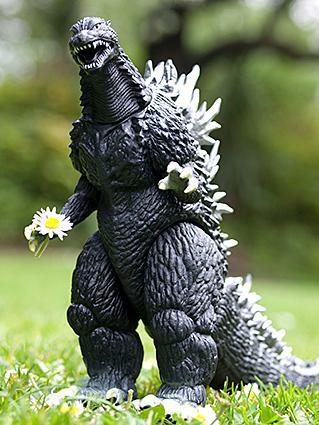 Godzilla 6.5 Inch Deluxe Classic Action Figure: This classic Godzilla is modeled after the 1968 version. It is done in vinyl and features limited articulation and is sculpted with great attention to detail. It is priced under $30. Godzilla Japanese 9 Inch Figure: This figure from 2002 is done in clear, smoky vinyl. It is a limited item and is priced under $110. Generation Evolution Pack: This two pack was released in 1991 for the movie Godzilla vs. King Ghidorah. It contains one Godzilla and one Godzillasaurus Bandai. Both figures are articulated at the arms, legs and tails. This pack is priced around $300. 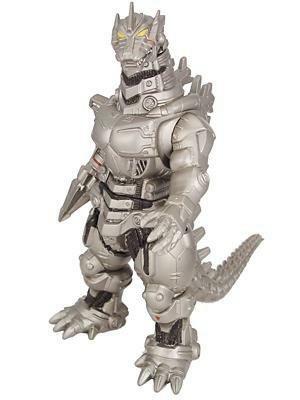 Diecast MechaGodzilla by Bandai: This chrome figure is from 2003 and is done in diecast metal. It is very detailed and articulated. It is priced around $120. Godzilla Mini Figures: This brand new set of eight figures is priced under $20 and is made from hard plastic. Each figure measures two inches in height. Mecha Godzilla Vinyl Figure: This large action figure measures seven inches in height. It is priced around $25 and is imported from Japan. Rodan Bandai Japanese Vinyl Figure: From the 2005 Final Wars, this figure of Rodan stands six inches tall. It is made from high quality vinyl and capture the Kaiju character with outstretched wings. Godzilla Urban Vinyl Action Figure: This Godzilla is priced under $18 and measures five inches in height. It is somewhat cute yet edgy making it both fun to collect and play with. Godzilla Fusion Black Spikes: This figure is priced around $13 and is made from a super-soft vinyl. It is modeled after the 1968 Godzilla and has black spikes on its back. Rainbow Mothra: This figure of the Mothra is semi-articulated and stands over six inches high. The wings of the Mothra are colorful and detailed. This figure is priced around $13. Both collectors and kids can enjoy the detailed craftsmanship of many Godzilla figures. These action figures are fun to display and even more fun to play with and have come to life. With a wide variety of prices and styles available, it is possible for everyone to own a pop-culture icon like Godzilla.